i do not have a special someone to spend this valentine’s day with, so i’m sharing it with my office-mates and all of you! these sweet little cupcakes are one of my favorites and are a big hit with my friends. i made the cupcakes per the recipe but added red food coloring to the frosting so that they would be a little more festive. enjoy! 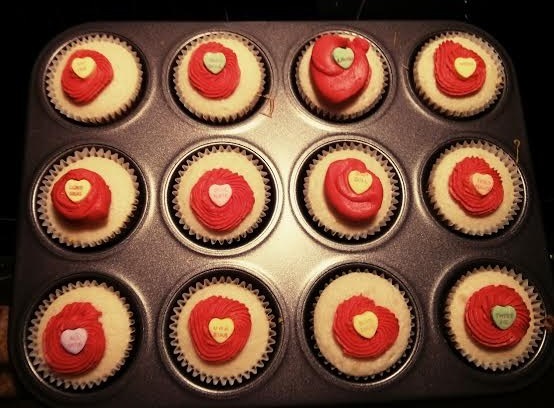 place cupcake liners in pans – you will need about 36.
in a large bowl, whisk together cake mix, flour, sugar, and salt. add remaining ingredients and beat with hand mixer for 2 minutes or until well-blended. fill prepared cupcake tins about 3/4 full. in a large bowl, cream together sugar and butter on low speed of hand mixer or stand mixer. add vanilla and whipping cream and continue to beat on medium speed for one minute more. scoop into a piping bag and pipe decoratively onto cupcakes or spread onto cupcakes, if desired.